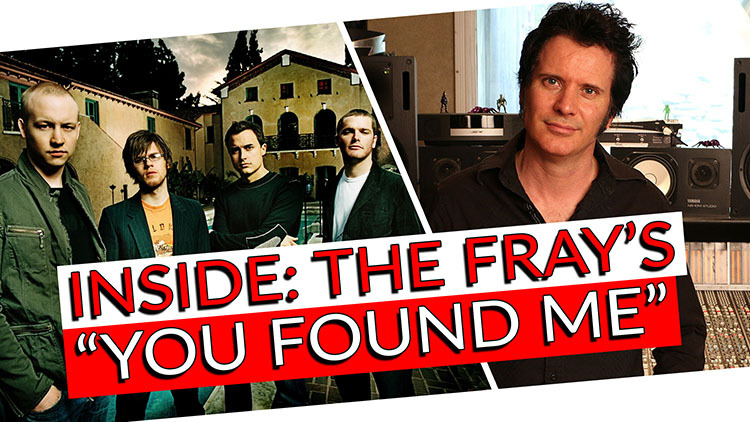 On this week’s Inside the Song, our very own Warren Huart breaks down The Fray’s “You Found Me,” which he recorded! Warren has worked closely with the band over the years on three of four studio albums, including the 2005 debut How to Save a Life and 2009’s follow-up, The Fray. The Fray were formed in Denver, Colorado in 2002 by classmates Isaac Slade and Joe King. Their talented songwriting put them on the global stage very early in their careers with the release of their debut record, How to Save a Life, in 2005. The lead single from the album, “Over My Head (Cable Car),” ensured their success on a national level as a top ten hit in the United States. The follow-up single, “How to Save a Life,” is what propelled them to worldwide recognition. The song was in the top 3 on the Billboard Hot 100 chart, and was a top 5 single across numerous countries, including Australia, Canada, Ireland, Italy, Spain, Sweden, and the UK. 2009’s self-titled album was equally successful following the release of “You Found Me” in November 2008. The single is also noted for being streamed over 400 million times across platforms, with over half coming from Spotify alone. Listen to “You Found Me” and other songs featured in this series on Spotify. “You Found Me” is the lead single from The Fray’s self-titled sophomore release. Following the incredible success of How to Save a Life, the eponymous song, and “Over My Head (Cable Car),” “You Found Me” became the band’s third single to sell over 2 million digital copies in the US. Over the years it’s earned itself a classification of one of the most downloaded rock songs ever, and some relatively dated numbers (as of February 2015) have marked it at 3.6 million copies sold! The song started gaining momentum when YouTube videos of live performances surfaced in late 2007. The Fray were on tour in support of their debut album and had begun playing “You Found Me” to worldwide audiences. At the time, it was still called “Amistad,” sharing it’s name with a cargo ship that became famous for a slave revolt in 1839. The song was started at the Plant Studios in Sausalito, California and finished at The Fray’s own studio in Denver. Additional keyboard overdubs were recorded by Zac Rae at Glenwood Place in LA. The Plant in Sausalito enjoyed a rich history over the years from its opening in 1972. It’s very famously where Stevie Wonder recorded parts of Songs in the Key of Life and where Fleetwood Mac recorded Rumours. The Plant is also where a 19-year-old Prince recorded his debut album in 1977, and where Rick James became in fixture in the early ’80s. The Fray were one of the last bands in the studio before its closure in 2008. The session wasn’t without its hurdles. After 36 years of operation, The Plant was in somewhat of a state of disrepair by the time The Fray arrived in 2008. Warren recalls the Neve 8068 console “falling apart,” barely working at all. The first four channels didn’t pass any audio, and it seemed like a sneeze would destroy the board altogether. The session also came with a brand new assistant who, at the time, was very inexperienced to be handling the project. A week or so into the session, Warren recalls going out to breakfast with the band and returning to the studio to find the locks had been changed. Sparing the details, it was occurrences like these that added to the stress of the session. The band wasn’t phased much by it, but the responsibility was on Warren to keep his composure, find solutions, and have things flow as smoothly as possible despite the many challenges. “You Found Me” went through some major changes before being finalized. As is the case with many of Isaac Slade and Joe King’s songs, “You Found Me” had a hooky piano line, an amazing verse melody, a solid chord progression on the chorus, and all the trappings of a great song. However, it wouldn’t be entirely finished until the tail end of the session. Warren had to recall drum sounds months after the session. The biggest change “You Found Me” underwent before its release was a rearrangement of the drum groove on the chorus. This meant that Warren and drummer Ben Wysocki went back to the studio a couple months after the main session had wrapped. Using a DrumDial tuner, Warren marked off the tension of the Ludwig Supra-Phonic snare head so that the exact tuning could be recreated on a new head for the later drum sessions. He also had thorough notes on microphone choice and placement, which wasn’t nearly as challenging as nailing the tuning from months before. The drum dial was a godsend in this case, as it’s nearly impossible to hear any difference in the drum sound between the verse and chorus! Everyone involved in making “You Found Me” knew it was something special. From the beginning, it was clear that “You Found Me” had potential to become a huge song. It did just that; in addition to a 2x platinum certification just months after its release, the song was nominated for a Choice Music: Rock Track award at the 2009 Teen Choice Awards. It ranked #13 on the Hot 100 Songs of 2009 list and #36 on Billboard’s Best Adult Pop Songs of the Decade list. It was also ranked #42 on Billboard’s Top 100 Digital Tracks of the Decade list and #61 on the ARIA’s list of the Top 100 Tracks of the Decade. The album, The Fray, was nominated for a GRAMMY.